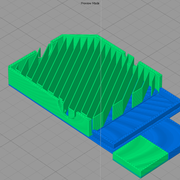 I'm trying to print a somewhat complex model where I combine TPU (PolyMaker PolyFlex) and PLA. The lower layers are mostly TPU, and I'm builing a PLA structure on top. Where ever the TPU is put on top of the PLA it seems to stick like super glue on fingers... The other way around though, the PLA has a hard time sticking to the TPU, especially my thin support structure lines. Any advise on how to make this stick well?